In the Assemblee compo forum, Zaratustra pointed out some tools for Windows to convert animated GIFs to sprite sheets. Here's some love for Mac and Linux people. Always keep a backup directory of your source images. These commands won't poop on your source images, but a typo might! 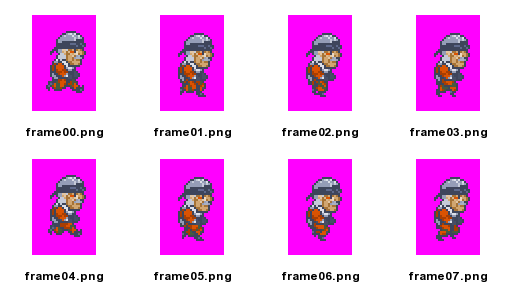 (If you're following along at home, the frames in this image are 64x96, not 32x32 like in the examples). If you're on Linux or Mac, and have ImageMagick installed, you can open up a terminal and type the following commands. If the source image has any semi-transparent pixels, then this will look bad. Change the 32x32 after crop to match the dimensions of your frames, and change the delay 6 to be whatever you want it to be. The delay is in 100ths of a second, so 6 is 16.6 fps, 5 is 20 fps, 4 is 25 fps, 3 is 33.3 fps, 2 is 50 fps, and 1 is 100 fps. Wow, NICE! I'm sure that this will especially be useful for people using the likes of flixel and FlashPunk. I'm sure that this would also be a good base for using ImageMagick in web scripts! ... maybe someone could write one for Assemblee? I've used these commands a lot in the past few days, thanks! Could you perhaps add the command to remove spacing from a tileset?